Golden Retrievers are famous for their friendly disposition, their intelligence, their loyalty, and their devotion to the one that they love. With so many wonderful attributes, it’s no wonder why this breed is one of the most beloved among pet parents! A member of the sporting group, Goldens (as they are often affectionately called) was bred in Scotland as gundogs. This breed is very serious when it comes to work; they assist hunters, work in fields, assist in search and rescue missions, and are commonly used as guides for the blind. They are also very keen on partaking in competitions, such as swimming, agility and obedience events. But they aren’t all work and no play; when they’re off the job, Golden Retrievers are completely devoted to their human companions. They love to play, cuddle, and make their families happy. This breed is medium in size and has a muscular build; but their most famous physical feature is their lustrous coat of thick, flowing, golden fur. If you are the proud parent of a Golden Retriever, there’s no doubt that you want to ensure that your furry family member lives a long, happy, and healthy life. To that end, you make sure that he has the best fitting dog collar for those daily walks; a collection of interactive dog toys, puzzle toys for dogs, and automatic fetch machines to keep them entertained and exercised, and a comfortable and supportive dog bed where he can enjoy restful snoozes. To maintain his beautiful coat, you bathe him regularly with a high quality dog shampoo; brush him out with a durable dog brush and keep his coat neat and trim with dog grooming clippers, and use a sturdy pair of nail clippers for dogs to give him puppy pedicures. While all of these products are essential for the overall health and well-being of your Golden Retriever, there’s something else that’s even more important: the dog food you feed him. Like all breeds Goldens have specific nutritional needs, and those needs must be met in order for them to live their best lives. What are the dietary needs of Golden Retrievers? Why is it so important for these needs to be met? In this review, we’ll answer these questions, but first, let’s discuss the type of food that you food should you fill your Golden’s dog bowl with. Here’s a look at our picks for the best dog food for Golden Retrievers. What are the Nutritional Needs of Golden Retrievers? Why Is It Important to Meet the Nutritional Needs of Golden Retrievers? Now that you’ve had a look at our top picks for the best Golden Retriever food, let’s take a closer look at each one. Below, we share a more in-depth overview of each formula, including an analysis of the ingredients in each recipe, why we think each option is a great choice for this breed, what we like about the formulas, and what other pet parents who have fed their Goldens the food have had to say. After you finish reading through the reviews and decide on an option that you think will best meet the needs of your four-legged family member, click on the buttons to find the best price currently available on Chewy and Amazon. Royal Canin dog food is highly regarded for their wide range of formula, including breed specific options, which are specifically formulated to meet the unique nutritional needs of specific breeds. Their Golden Retriever Breed Health Nutrition Adult Dry Dog Food is made, as the name suggests, to meet the dietary requirements of Goldens. This dry dog food is made for Golden Retrievers that are 15 months of age or older. It’s made with the highest quality ingredients to support the overall health and well being of this breed. This contains formula contains taurine, EPA and DHA to strengthen the heart, something that’s important for this breed, as they are prone to cardiac issues. It’s also infused with omega 3 and omega 6 fatty acids, which helps to promote healthier skin. Golden Retrievers are also prone to sensitive skin, so these nutrients are particularly important; and they’ll also foster a healthier, shinier, more lustrous coat. It’s also infused with nutrients that strengthen the joints and promote mobility. The size shape, and texture of the kibble is also specifically made for Goldens, thereby encouraging chewing and improving dental health, too. Ingredients include easily digestible brown rice and oatmeal, chicken meal, and anchovy oil; all of which contain a bevy of healthy nutrient. Based on the reviews that we read, the majority of pet parents who feed their furry friends’ this kibble are very pleased with it. Final Verdict: Overall, we are quite pleased with Royal Canin Breed Health Nutrition Golden Retriever Adult Dry Dog Food. Made to meet the specific nutritional needs of adult Goldens, this formula will support your four-legged family member’s overall health. Blue Buffalo dog food is hailed as one of the best brand of food on the market. That’s because it is made with premium quality, natural ingredient that fully nourish canines and appeal to their instinctual cravings. This formula contains a wealth of wholesome ingredients that will keep your adult Golden Retriever happy, healthy, and full. 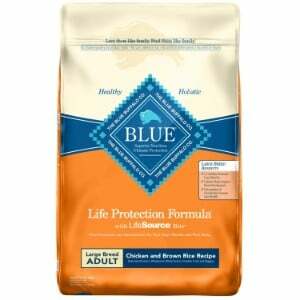 Like all recipes from Blue Buffalo, the first ingredient in their Life Protection Formula Natural Adult Large Breed Dog Food is real animal protein. In this recipe, this recipe, the protein is sourced from chicken that has been carefully deboned. It’ also a grain free dog food, as it doesn’t contain and wheat, corn, or gluten; instead, it’s made with healthy and easy to digest carbohydrates, like oatmeal, whole ground brown rice, and whole ground barley, so this recipe can also be considered a dog food for sensitive stomachs. Other natural and nutritious ingredients include whole carrots, whole sweet potato, cranberries, blueberries, dried kelp, turmeric, and dried chicory root. It’s also fortified with additional essential vitamins and minerals to ensure that the nutritional needs of your dog are being met. According to the majority of the reviews that we read, most pet parent are very happy with this formula, and so are their furry companions. Final Verdict: For a natural, wholesome food that is chock-full of healthy ingredients, Blue Buffalo Life Protection Formula Natural Adult Large Breed Dry Dog Food will surely please you and your Golden Retriever. It contains nothing but premium quality ingredients and is totally free of hard to digest grains and harsh additives and fillers. Next up on our list of the best dog food for Golden Retrievers is a Nutro dog food formula. Golden Retrievers are prone to food sensitivities and allergies and they often require dog food for allergies. Nutro Max Natural Adult Dry Dog Food is made with all natural, wholesome ingredient, and is completely free of chicken byproduct meals, corn, wheat soy artificial colors, artificial flavors and artificial preservatives; in other words, it has none of the bad stuff that can spark allergic reactions and all of the good stuff that will support your pet’s health. The first ingredient in this recipe is chicken meal, which is easier to digest than, and is packed with protein, glucosamine and chondroitin sulfate; nutrient that support joint health and improve mobility. Brewer rice, whole grain oatmeal, alfalfa meal, whole brown rice, and flaxseed are easily digestible carbs that will fuel your pup’s energy levels. This formula is also fortified with essential vitamins, minerals and nutrient, like vitamin B12, iron, amino acids, biotin, and vitamin E, so it will nourish your furry friend’s skin, promote a healthier and more lustrous coat, and strengthen his immune system and cardiovascular health. The reviews provided by customer were very positive; most pet parents are very pleased with this product. Users claim that it helped to reduce skin irritations and eased stomach woes. 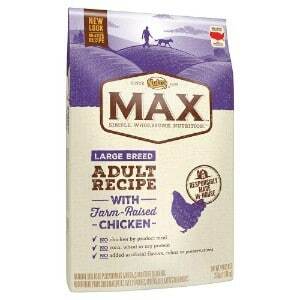 Final Verdict: Nutro Max Large Breed Adult Dry Dog Food is ideal for Golden Retriever. It’s made with all natural ingredient and is completely free of harsh grains, byproducts, fillers, preservatives, and artificial colors and flavors, so it’s easy on tummies and won’t aggravate allergies. 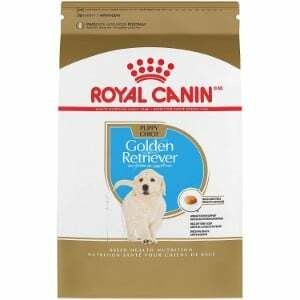 If you have a puppy Golden Retriever, then Royal Canin Breed Health Nutrition Golden Retriever Puppy Dry Dog Food will ensure that he grows into a strong and healthy adult. Puppy Goldens have different nutritional needs than adult, and this formula is made to meet those needs. Made for Goldens who have been approved by a vet to transition from their mother’s milk or a puppy milk replacer and up to 15 months of age, this recipe is loaded with essential nutrient that your little love needs to thrive. Omega 3 and omega 6 fatty acids nourish the skin and coat, while L-carnitine supports cardiovascular health and strengthens the muscles. Antioxidants help to neutralize the damage that free radicals cause and boost cognitive function, so your pooch will be even smarter (and may even be better equipped to take on the more challenging tasks in your dog training book!) Ingredients in this recipe include chicken meal, brewers rice, fish oil, dried beet pulp, and vegetable oil, as well as a variety of essential vitamin and mineral supplements. The kibble is also designed for the smaller mouth of a puppy, making it easier to grasp and chew thereby promoting stronger teeth. Most reviewers agree that this recipe is excellent for their puppy Golden Retrievers. Final Verdict: With Royal Canin Breed Health Nutrition Golden Retriever Puppy Dry Dog Food, your Golden puppy will get all of the nutrients that he needs to grow into a healthy, strong, and smart adult. 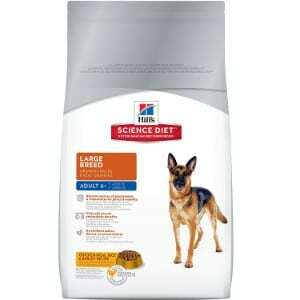 The last food on our list of the best dog food for Golden Retrievers is Hill’s Science Diet Adult Dry Dog Food. Hill’s Science Diet dog food is made by a team of animal nutritionists, food scientists, and veterinarians, so you can rest assured that it contains the perfect balance of essential vitamins and minerals that your Golden Retriever needs to thrive. This recipe contains real chicken as the first ingredient, so it’s packed with protein, which supports the development of strong, healthy muscles. It also contain natural sources of glucosamine and chondroitn to further promote joint health, which is important for Goldens, as they tend to suffer from hip dysplasia and arthritis as they age. Antioxidants help to flush out the damage caused by free radicals and support a strong immune system. Brown rice, cracked pearled barley, and whole grain oats will fuel your Golden’s energy levels, and natural ingredients like apple, broccoli, carrot, cranberries, and green peas add to the wholesome goodness and the delectable flavor. 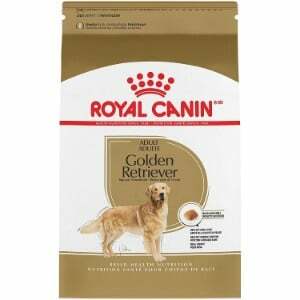 Mot pet parents who use this food are very pleased with it, and report that their Goldens love the taste. Final Verdict: To ensure your adult Golden Retriever is getting the nutrition that he needs to thrive, Hill’s Science Diet Adult Large Breed Dog Food is a great choice. It’s full of essential vitamins, minerals, and nutrients that will keep your pup happy and healthy. There’s no doubt that you want your Golden Retrieve to live a long, happy, and healthy life. In order to do that, it’s vital that you feed him a high-quality dog food that is nutritionally balanced and packed with the essential nutrients that he needs to thrive. But, with so many different types of dog food brands, and so many different kinds of formulas, trying to navigate through all the different options and pick the very best food can seem like a daunting task. To help ensure that you are selecting a premium-quality dog food, we’ve put together this buyer’s guide. Below, you’ll find out what type of nutritional needs Golden Retrievers have, and why it’s so important to ensure that those needs are being met so you can choose a recipe that will not only make him happy, but will also make him healthy. Like all dogs, Goldens need the right balance of protein. Their food should contain a minimum protein content of 25 percent, and that protein should come from quality sources, like chicken, beef, venison, or fish. Protein supports the development of lean muscles and strengthens the joints, which is crucial for active Golden Retriever. Healthy fats. Goldies also require the right balance of healthy fats, such as omega 3 and omega 6 fatty acids, as it helps to support their skin and coat health. Their food should not contain more than 20 percent fat, though; any more could lead to health complications, like obesity, which can cause a number of issues. Calcium, vitamin A, vitamin E, and B vitamins are all vital for the health of Golden Retrievers, too. They help to boost metabolism, nourish the skin, support the joints, and improve cardiovascular function. This breed also requires nutraceuticals like EPA, DHA, and ALA, which help to improve heart health and strengthen the immune system. Joint issues. Golden retrievers, like most medium and large breed dogs are prone to joint problems, like hip and elbow dysplasia, as well as arthritis. By offering your pooch food that contains protein, glucosamine, and chondrotin, you can help strengthen the muscles, joints, and bones and minimize the chances of developing these conditions. Cardiovascular disease. Goldens are also prone to heart health problems. Offering your pup food that contains antioxidants, B vitamins, EPA, DHA, and ALA, will strengthen his heart and lower the risk of heart problems. Skin issues. Golden Retrievers are notorious for skin problems. Their skin tends to be very sensitive; it can dry out and break out easily, which can lead to severe itching and discomfort. It can also cause problems with the coat, as they can start losing hair. Vitamin E, omega 3 and omega 6 fatty acids, and biotin are all nutrient that nourish the skin and make the coat thicker, fuller, and more lustrous. In other words, by offering your furry friend food that contains a balanced blend of essential vitamins, minerals, and nutrients, you can help to ensure that he lives the happiest and healthiest life possible. To select the best dog food for Golden Retrievers, we assembled a team of animal nutritionists and veterinarians. We kept the dietary requirement of this breed in mind, and together, we reviewed dozens of different brand and formulas. Based on our assessments, we were able to narrow down the options to the five formulas listed in this review. Each option contains the right blend of vitamins, minerals, and nutrients that Golden Retrievers need to thrive. By feeding your Golden Retriever the best food possible, you can ensure that he lives a long, healthy, and happy life. When nutritionally balanced food is combined with regular exercise, routine veterinary care, and plenty of love, your Golden Retriever will flourish. Each of the formulas listed in this review meet the dietary requirements of this kind, lovable, gentle, and loyal breed.